Never Settle — Leeja Carter, Ph.D.
It’s always so funny how your parents are right about stuff. I can proudly admit, however, that my father and mother have been right about ways in which I must lean into my career, relationships, and personal growth. 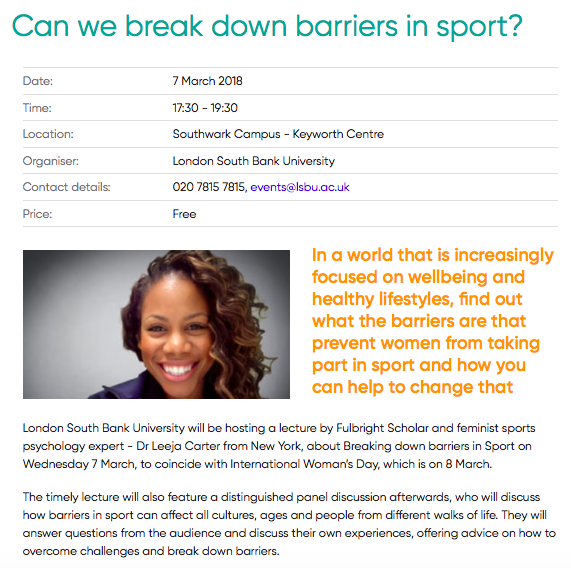 I am looking forward to sharing on March 7th at LSBU's "Can We Break Down Barriers in Sport" event one such piece of advice from my father, in my talk titled: “Never Settle.” I’ve shared a bit of his genius before at a Keynote at Springfield College where I shared how his words have fueled my feminism and advocacy work. My father who was born, raised and died in Chester Pennsylvania challenged me on transferring my education to advocacy and being authentic in my work and personhood. In that, it was quite interesting when someone asked me a few years ago how I became a feminist. How do you answer a question like that? Feminism is such a process, a journey, and walk of discovery and awareness that can’t be easily summed. I am still on that walk and living in a spirit of curiosity every day as I learn. In any case, I didn’t jump into feminism - and in thinking about it now, perhaps I’ve always been a feminist. For instance: I was the first girl altar server at my Catholic Church. Attending the mass every Sunday I watched the boy altar servers and wondered, “how do I get to do that and why aren’t there any girl altar servers?” Recognizing that altar serving was positioned as a mentoring opportunity and pipeline to leadership in the Catholic Church for young boys, there was not a space for young girls who didn’t want to be nuns, to assist during service. One day I voiced my interest to my mom, and my mother being my mother, said we're going to speak to the priest. One day after mass we spoke to the priest who said this hadn't been brought up before and he'd talk to others and let us know. I was eventually told I could be an altar server after I complete the training/classes to do so. Needless to say, I completed all the training and became the Church's first altar girl. Was that being feminist? I suppose. Certainly an early beta version for me. As a young girl, I just wanted to do what I wanted to do and had no awareness as to why girls hadn't been welcomed to serve before. However, in my interest and curiosity, the questions arose: "why not me and now?" AND shout out to my mom for walking me up to the priest after church and advocating for her daughter's interest and right to be an altar girl. So what does this have to do with my father, sport, and sport psychology? Well, it has to do with like everything. Because fast forward to the year before I was accepted into Temple University's Ph.D. in the Psychology of Human Movement program having come from a non-sport psychology and more clinical psychology background and with my interest in Black women's physical and mental health seemingly more health psychology. I was sitting on my father's couch asking his advice on if I should go into health psychology or sport psychology for my doctoral training. Not knowing much about sport psychology, but having a background as a college athlete and completing a thesis on anxiety and motivation among track and field athletes (but in a non-sport psychology program), I still didn't feel confident I could hack a sport psychology doctoral program. The kicker was, I met this guy. Gosh, there’s always a guy. LOL. But for real, I met my soon to be mentor, chair of Temple University's doctoral program, and (now) a second father figure, Dr. Michael Sachs who I spoke to about Temple's program. I really liked his energy and honesty. I mentioned him to my father. I told my father that while I hadn't felt extremely confident about knowing everything about sport psychology, I felt that this Dr. Sachs would be able to mentor me into the professional woman I hoped to become. Well at that moment, my father said to me, "well, don't settle. If you think Dr. Sachs can help you, go to Temple." My father’s advice did not come from a conversation about gender inequality or ways in which society should come to bring equity to structurally oppressive systems. I’ve learned that settling can surely take many forms, for which we can observe, recreate, and even allow ourselves to settle in many ways. For example, my mother's support exemplifies ways in which we can simply lean in. After I became an altar girl, other girls were permitted to serve. My father’s words resonate with me as we move into an age of social consciousness where the measure of our success for women’s rights, civil rights, and human rights is indicative of how we look to our past for insight and inspiration, stand in our present bravely challenging systems of oppression and our own comfort zones, and look up to the future inspired to create a better world for the next generation.